An ankle sprain occurs when too much stress is put on the ligaments in the ankle, which causes them to stretch or tear. 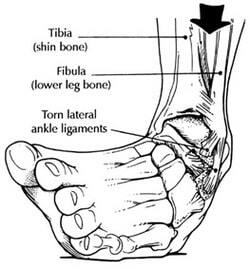 Lateral ankle sprains, the most common variety, occur when the foot rolls inward. Medial ankle sprains, in which the foot rolls outward, are less common, but can result in a fracture because the ankle joint does not allow for much medial mobility. Ankle Sprains, if not taken care of properly, can keep runners benched for several weeks or months and severely impact training. Treatment – Most of the swelling following a sprain occurs within the first 24 hours. With any type of ankle sprain, it is important to take care of it right away by using the RICE Method (rest, ice, compression, elevation). Rest the ankle by stopping your activity and taking care of your injury. Ice the sprained ankle as soon as possible to help control swelling and alleviate pain. Ice for 15 minutes every two hours. Compression can be accomplished using an elastic bandage, compression socks, or a compression sleeve. Elevation of the ankle joint will help your fight against gravity. Elevating above your heart will decrease swelling and pain in the ankle.